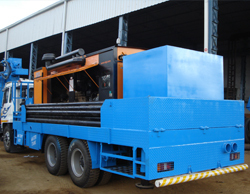 BEAVER BTHR-450 Model, Truck Mounted Hydraulically Operated Water Well Drilling Rig can capable of drilling from 6” to 8” Dia. Bore Holes in hard rock by DTH method, upto 14½” Bore Holes in Unconsolidated / alluvial formations using water / foam flush by Rotary method & Unconsolidated / Gravel / Boundary Formations using ODEX tools up to a depth of 450 Meters (1500 Ft.) under favorable Drilling Conditions. The hydraulic pumps shall be powered by either same truck engine through PTO or by a separate diesel drive deck engine. 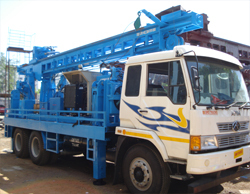 It is a two truck version drilling rig. Airline Lubricator capacity : 30 Ltrs. Suitable Mud Pump : 8”x6”. Driven by either a separate engine or with Hydraulic Motor.